California Department of Fish and Wildlife's Greg Gerstenberg shows off a frozen nutria head. They've captured just over 300 of the invasive species so far. These rodents have destroyed levees in Louisiana, converted wetlands to open water in the Chesapeake Bay. And, earlier this spring they were detected in California, in the Central Valley. Over the past few months, they’ve been multiplying and making their way to the Sacramento/San Joaquin Delta. And, the Delta — with its thousands of miles of waterways and levees — is essential to California’s water supply. Nutria could put all of that at risk. 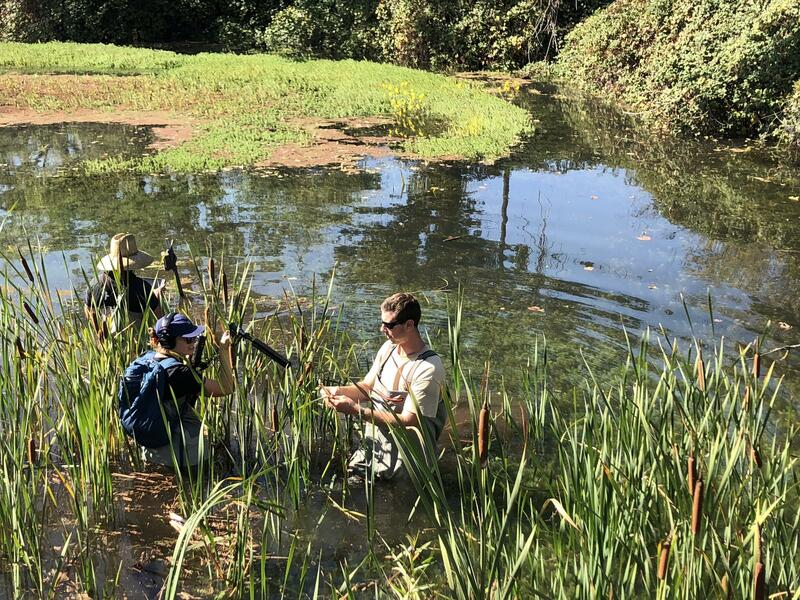 So, as KALW’s environment reporter Angela Johnston found out, the California Department of Fish and Wildlife quickly formed a team to stop the nutria in their tracks. Sean McCain didn’t really even know what a nutria was before he applied for a job as the state’s only nutria biologist. He’s fresh out of grad school, and learned about them when he was listening to a conservation podcast a few months ago. Now, he spends his days in the Central Valley, sneaking quietly around marshland, looking for these giant, buck toothed, beaver-like creatures. “I don’t think they know we're here yet,” he says as we quietly walk up to the edge of a pond near Snelling, off the Merced River. McCain first saw a family of nutria here two weeks ago. Since then he’s been coming back to this spot almost every day to spy on these guys. He’s noticed something else, too. Nutria can eat up to 25 percent of their body weight in one day. They munch on the roots of green duckweeds, cattails, and tule reeds. If they clear cut an entire marsh like this one, they put all the birds and frogs and other species that depend on it at risk. Sean McCain scouts out nutria across the marsh. Because they like to burrow, nutria can erode the land around these swamps. They can even destroy levees. 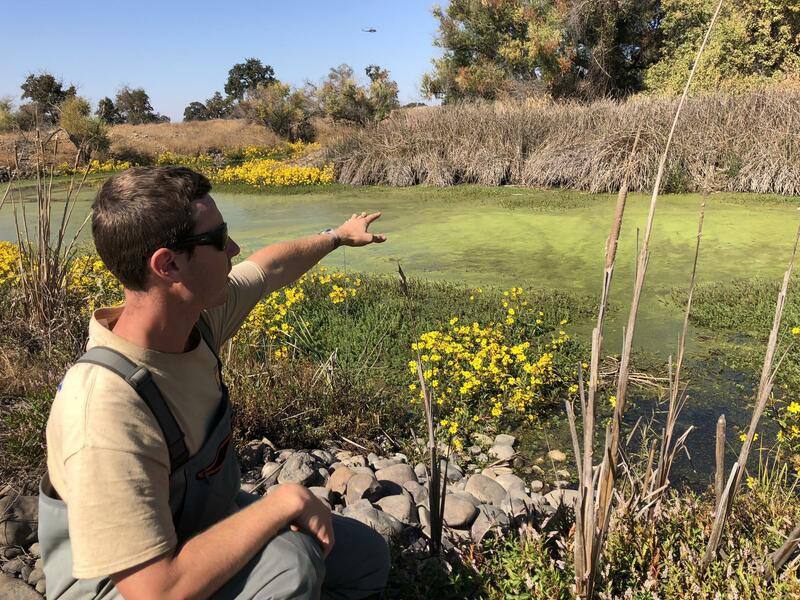 The nutria problem is potentially so big that the California Department of Fish and Wildlife is pulling staff from all over the state to train in nutria eradication. That’s why today, Sean’s joined by two fisheries biologists from the Sacramento Area. At another pond, they haven’t seen any nutria in the flesh, so they’re setting up a wildlife camera to see if they can capture them on tape, and creating a feeding platform within the camera’s range. They wade into chest deep water, yank reeds out of the marsh, and put bait on a wooden platform: bright orange slices of sweet potato to lure the nutria . Merced County is the sweet potato capital of California, and farmers have donated barrels because they’re worried about nutria’s looming threat to the entire ag industry. “We try to make it visually appealing so that it will hopefully attract nutria to the platform so we can get them on camera,” Sean says. Sean does this kind of work all day long: trying to get eyes on nutria, assessing habitat, and checking cameras. When we get back to the car, he plugs a SD card from one of the wildlife cameras into his laptop and we watch. Sean McCain points out ideal nutria habitat. Now that the team’s confirmed a big family of nutria in this swamp, they’ll send in trappers, who will set traps all over the area to start to eradicate this population one by one. It’s part of a larger eradication plan taking place at the nutria incident command center at an old hunting check station near Los Banos. Greg Gerstenberg holds down the fort here as the incident command chief for the nutria task force. On the walls of the command center, huge maps of the Central Valley and Delta are covered with pink, yellow and blue dots showing where nutria have been spotted and where they suspect they’ll be. These maps help people like Sean determine where to set cameras and traps. And it tells them when they should pull their scarce resources from one area, and move to another, like the vulnerable Delta. Greg Gerstenberg heads up the nutria task force out of Los Banos. “Our goal is to keep them out of the Delta, to protect the levees and the wetlands of the Delta, and try to get them when they're still in this marginal habitat,” Greg explains. If the nutria start breeding there in large numbers, they could erode levees and compromise the state’s water infrastructure and farmland. Greg hadn’t even heard of nutria a year ago. When a trapper unintentionally caught one while he was looking for beaver, he called up Greg and said, ‘Hey I think I trapped a nutria.’ “And I was thinking at the time what's a nutria,” Greg remembers. So he googled it, had the guy bring it in, and they did an autopsy. Turns out, a female nutria can produce up 200 offspring in just over a year! So Greg had to get on it fast. Seven months in, they’re still learning on the job and training dozens of other state employees every month who come to this command center to learn the basics, like how to identify a nutria. Greg displays different size nutria Fish and Wildlife stores in their freezer. In the deep freeze outback, Greg rummages around for frozen nutria. He pulls out nutria heads with giant orange buck teeth, and bottles of their urine –– helpful for trapping. They’re keeping these for training, and so they can give some to other departments to taxidermy and display in their offices, say if a farmer wanted to come and see what one looked like. They’re also looking to how other states have dealt with the problem. Louisiana’s offering a bounty to hunters to counter their out-of control nutria problem, and Greg‘s modeling California’s efforts off of Chesapeake Bay’s, where they successfully eradicated nutria. The state's 300th captured nutria. He hopes by the time he retires in five years, there won’t be any nutria in California. And while he thinks there are thousands out there right now - and a new breeding population was just found in the Delta, he tells me they’ve only caught 299. As I begin to pack up my things, a Fish and Wildlife trapper walks into the command center. Greg asks him if he caught anything. Number 300, he says. An ominous milestone, but next month, once they start surveying the Delta, Greg thinks that number could double.